How do I personalize a gift online? 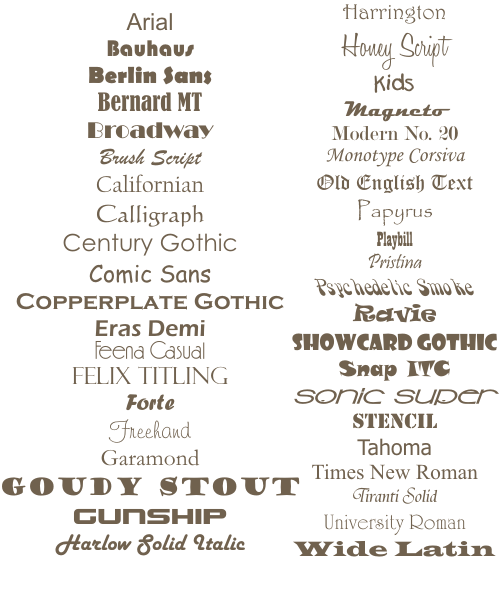 What font styles do you offer? How do I give more personalization details? How do I personalize with a logo? Do I have to create an account to order online? Can I order online and pick up in person? I can't find an item on your site. Can I still order it? Can I get a discount if I order a large quantity? How can I get a quote on a business or large order? Does the packing slip include pricing information? Why is a gift date required on all items? How do I send a gift to someone else? Can I ship my gift directly to recipient? Personalization is free and is included in the cost of the gift item. Some items can be purchased with additional options for an additional fee. Those fees vary depending on the item. You can use the personalization form at the bottom of the listing to personalize your gift before adding it to your cart. For more detailed information on personalizing your item, click here. How do I give more specific engraving instructions? For any added information that isn't specified in the personalization form at the bottom of the listing, please leave as much detail as possible in the special instructions field in the listing form before adding the item to your cart. How do I personalize a gift with a logo? You can upload your logo in the personalization details at the bottom of the listing. Do I have to create and account if I want to order online? No, you can make a purchase as a guest. But, we do recommend creating a customer account online for a number of benefits. For more information on the benefits of creating an account, click here. We accept VISA, Discover and Mastercard using Paypal. You do not need a paypal account to pay with a credit card on our website. Yes, if you are a local customer, you can purchase online and choose local pickup (no shipping charge). I can't find an item on your site, can I still order it? If the item you're looking for is not on the website, we maybe still be able to get your gift item to you. Please contact us for more information. Can I get a discount if I purchase a large quantity of gifts? Yes, most items have quantity discounts. If an item has bulk pricing, the link will be under the "Add to Cart" button on the product listing page. You will need to contact us immediately. If your order has not been processed, you can make this change without any additional fees. How can I get a price quote for a business or large order? If an item has bulk pricing, the link will be under the "Add to Cart" button on the product listing page. No the packing slip does not contain any pricing or financial information. Why is the gift date required on all items? On each listing, there is a gift date to choose from. This is the date you plan to present your recipient with their gift. We use this as a guide to get customers their items in time. However, this doesn't men that orders with farther gift dates are pushed to the back of the line. If there is no specific gift date, just choose today's date. In viewing your cart, click “Checkout”. Enter all of the billing and shipping information. At the Order Confirmation (Step 5), a box under your grand total is where you will enter your coupon code. Click “Apply” and your order total should reflect the discount before you submit your order. In viewing your cart, click “Checkout”. Enter all of your billing and shipping information. At the Order Confirmation (Step 5), a box under your grand total is where you will enter your gift certificate code. Click “Apply” and your order total should reflect the discount before you submit your order. At the time of checkout, enter the recipient's address as the shipping address. For customer accounts, you can add their information in your address book for future purchases. We ship all of our orders using USPS Standard, Priority or Express Mail. Most orders are shipped within 5-7 business days after the order is placed. However, some orders are able to be shipped in 24 hours. If you're needing a rush order, please contact us to for a more accurate turn around time on the items you need. Shipping costs depend on the amount of your entire order. For more information on shipping, click here. We can ship internationally, but don't have the pricing included on the website at this time. If you are needing to ship outside of the United States, please contact us for a price/time quote on your gift item prior to purchase. To track your order online, you will need to login to your customer account and click "Check order status" at the top right corner of the screen. You can view all of your orders placed on our website to get a status on your order. Can I ship my gift directly to the recipient? Yes, you can add your recipient and their address to your address book using your online customer account. There is no additional fee for this and the packing slip does not include any pricing or financial information. Still can't find the answer to your question? Contact us today!